Singles Day shopping event in China, which happens every year on November 11th, is like no other shopping event. In fact, it is the largest shopping event in the world. Many times larger than the Black Friday and Cyber Monday combined are in the US. The numbers are hard to grasp. In 24 hours Alibaba sold $25.3 billion worth of goods this year. In comparison the 30-hour Amazon Prime Day generated estimated $1 billion in sales only. This equals to $292,824 worth of goods sold every second for 24 hours straight on Alibaba. Compared to $9,259 during Amazon’s Prime Day. Alibaba’s sales were up by 39% this year. And 90% of that $25.3 billion was done on mobile phones. Mobile has been crucial to China’s e-commerce growth, as it enabled millions of new customers which previously had no other internet access. Powering these sales on Alibaba was 1.48 billion payment transactions on AliPay, a payment processor by Ant Financial, an affiliate of Alibaba. Transactions peaked at 256,000 per second. For context, on average all of Visa credit cards in the world total to 2,000 transactions per second. For even more context, 1.48 billion transactions on AliPay are close to the total transactions on PayPal in 2017 Q3 at 1.9 billion. Alibaba’s Tmall.com has more than 55% of the B2C market in China. Then there is JD.com which announced $19.1 billion during the Singles Day, interestingly more than Alibaba did in 2016. JD.com accounts for 25% of the market. eBay worldwide GMV for the last 12 months was $81.93 billion. Alibaba and JD.com in 24 hours processed more than half of eBay’s yearly GMV. Alibaba and JD.com combined did $44.4 billion in sales in a single day. It’s not unreasonable that in total all of China online retail did north of $50 billion. Which is a staggering amount of sales when compared to the estimated $410 billion total online sales in the US this year. Alibaba launched its first Singles Day online sale in 2009. For 15 years before that it was a tradition born out of universities - most attribute its origins to Nanjing University in 1993. It grew originality from there, but was not a major shopping event before Alibaba’s announcement. However Alibaba never officially tied itself to the Singles Day, and have since started to use the double-eleven term for its day of sales. In 2009 China’s e-commerce share of total retail was barely 2%, and Tmall.com was just as small too. But since then e-commerce has grown to 15% of retail, and Tmall.com, Taobao.com, and JD.com have all grown by many multiples. Both Singles Day, and Amazon’s Prime Day are artificial celebrations, created to increase shopping. Prime Day has grown, but has also faced criticism from customers which failed to find good deals. It is an effective promotion for Amazon’s own Echo Devices, and Prime memberships, both of which are key highlights. 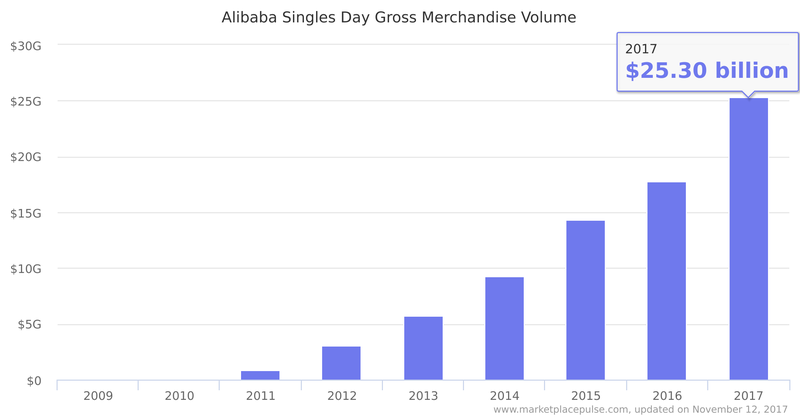 Singles Day on Alibaba, which itself doesn’t sell any products, and only runs marketplaces, is a more fair event for merchants on the platform. Alibaba shared that top 5 countries selling to China during the event were Japan, United States, Australia, Germany, and South Korea. In that order. 167 merchants each generated more than $15.1 million (100 million Chinese yuan) in sales, 17 merchants surpassed $75.4 million (500 million Chinese yuan) in sales, and 6 merchants surpassed $150.9 million (1 billion Chinese yuan) in sales. Given that 33% of top sellers on Amazon are from China, and as much as 40% of top sellers on eBay are from China, there is no question that Chinese retailers and manufacturers are well suited to transact in the US. They are a major share of international sellers on all global marketplaces. US retailers on the other hand are mostly invisible on marketplaces in China. Some international brands are doing well, but few of the millions of sellers on Amazon can say the same thing. Prime Day was shared by more international sellers than Singles Day was. Thus the challenge is how well can US retailers and brands partake in China’s online retail growth. Which by all measures is the largest e-commerce market.